Twitter Party TOMORROW (7/1) with L’Oreal! We would love to have you join us! We’re chatting about suncare and L’Oreal’s Advanced Suncare Products. You don’t want to miss it! With the summer in full swing, it’s important to make sure you’re protecting your skin. L’Oreal has 13 different products in their Advanced Suncare line that have been created to give you the best coverage and protection. We’re also excited to announce that we will have an expert with us throughout the Twitter Party – Dermatologist, Dr. Gervaise Gerstner. 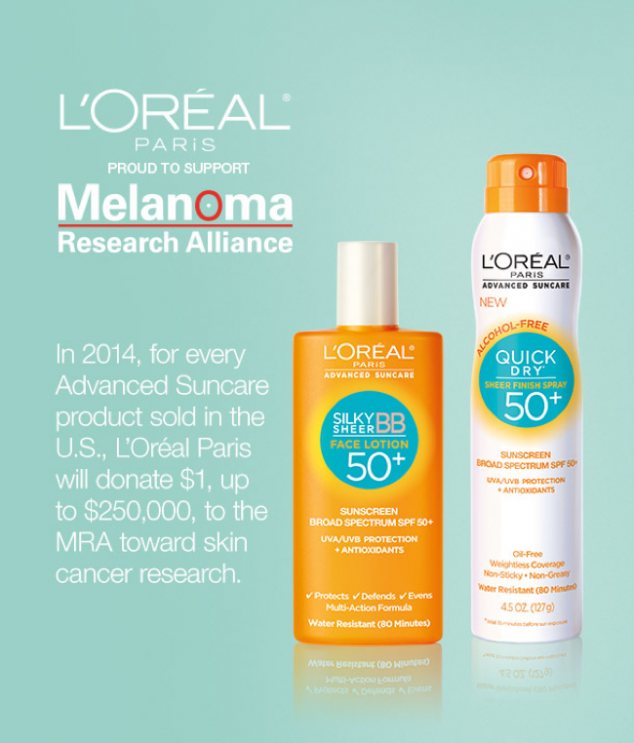 L’Oreal has taken great measures to make a difference in the world and preventing Skin Cancer. They have partnered with the Melanona Research Alliance (MRA), which we will be discussing, too! It will be a great discussion and a fun time! *We will be choosing the winners at random. Previous Post: « Enter To Win One Of FIVE $75 Lisa Leonard Gift Cards!